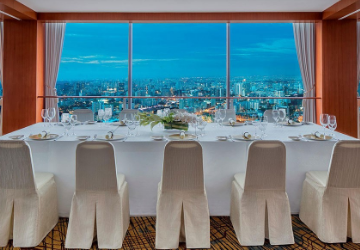 With cutting-edge facilities, the Raffles City Convention Centre at Singapore’s Swissotel The Stamford frequently hosts some of the most glamorous high-profile events in the city. Our trio of ballrooms provides sensational venues for international conferences, weddings, gala dinners and fundraisers in a range of adaptable spaces. The magnificent pillar-free Fairmont Ballroom can accommodate up to 3,000 guests beneath its dramatic ceiling. Unrivalled technical amenities are available with full support from our team of professional events staff. Book it as one impressive space or three smaller venues: Canning, Padang and Collyer. The glittering Stamford Ballroom can be tailored to suit every social or business event while our white Atrium Ballroom brings a touch of pristine Alpine freshness with three separate rooms: Moore, Morrison and Hullet, which can be combined into one capacious entertaining space. Fairmont Singapore and Swissôtel The Stamford are dedicated to making your wedding journey as seamless as possible with our total wedding experience, a completely integrated service including our personalised Wedding Concierge and comprehensive information on everything you need to plan the wedding of your dreams. Speak to our personalised Romance Team and find out how to customise a wedding that promises to fulfill your every desire. 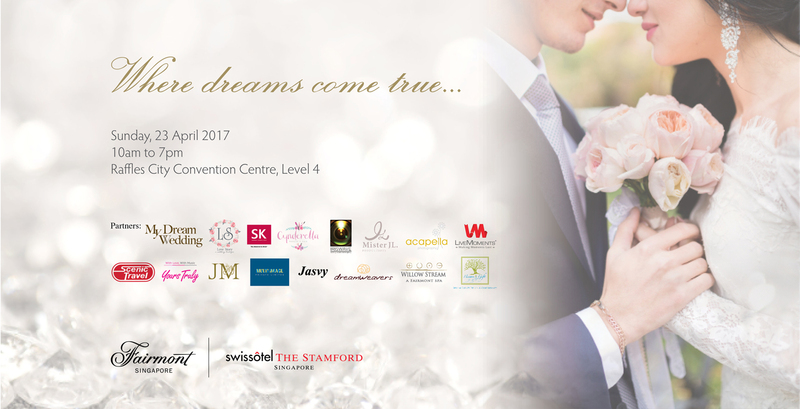 Fairmont Singapore & Swissôtel The Stamford is where your happily-ever-after begins. Be the first to preview four new wedding themes inspired by the beauty of the seasons – Spring, Summer, Fall and Winter – on Saturday, 22 September 2018. Discover how each theme is magically interpreted in the magnificence of our newly refurbished ballrooms, where you will be enthralled with an enchanting bridal showcase by WhiteLink and captivating musical performance by Carpark Tunes. 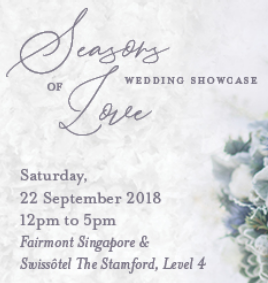 All this as you savour delectable culinary delights from our wedding menus, discover new personalised wedding packages, tour our renovated bridal suites, and browse wedding options from partners like Bettr Barista, Carat 55, Dreamweavers, Jasvy, Live Studios, Robinsons and Self-Print Singapore. 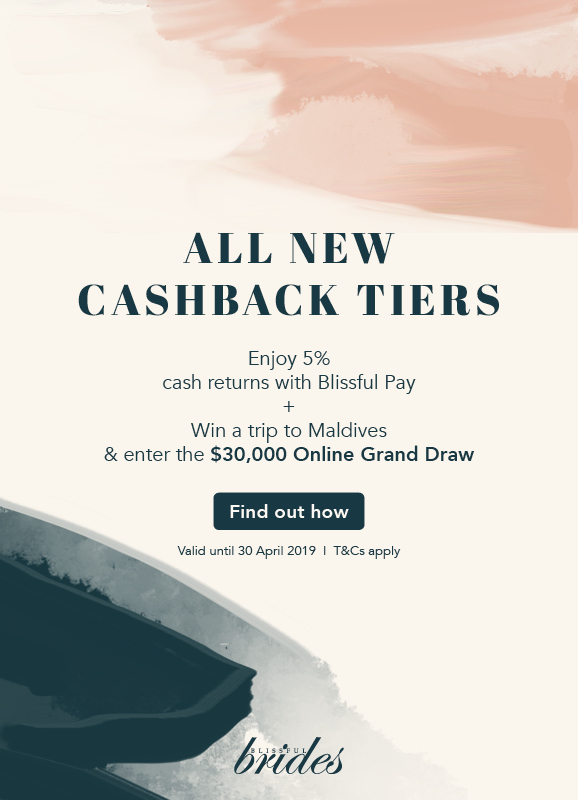 Confirm your wedding with us at the wedding show and stand to win attractive prizes worth over $30,000 including cash rebates off your wedding banquet, 50% off bridal packages, and honeymoon stays at Sofitel Bali Nusa Dua Beach Resort or Fairmont Sanur Beach Bali. Registration at S$38 nett per couple, OCBC cardmembers enjoy an exclusive entrance fee at S$28 nett per couple. For enquiries or to book an appointment, please call our Romance Team at +65 6431 5530 or email weddings.singapore@fairmont.com. Be inspired by new exquisite wedding themes and a delectable spread of Halal-certified cuisine at our Prestigious Malay Wedding Show at Asian Market Café on 25 March 2017. Speak to our personalised wedding representatives and find out how we can tailor a wedding that promises to fulfil your every desire.